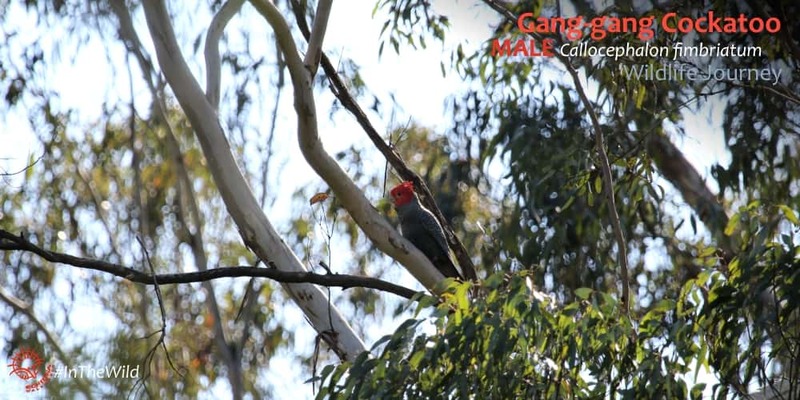 Gang-gang Cockatoos: the moving spirits of tall eucalyptus forest. Australia has many faces. There is the red desert Australia, the beach Australia, the Great Barrier Reef Australia, the tropical billabong Australia and the shearing-shed Australia. If you look more closely you will find the mallee Australia, the snow-topped mountain Australia, the ancient rainforest Australia, the Australia of Wilga and Mulga and Buloke. We love them all. Read about the Mallee Australia here. Then there is the tall eucalyptus forest Australia. Where giant Mountain Ash gum trees – Eucalyptus regnans – rise tall and straight to 100 metres. 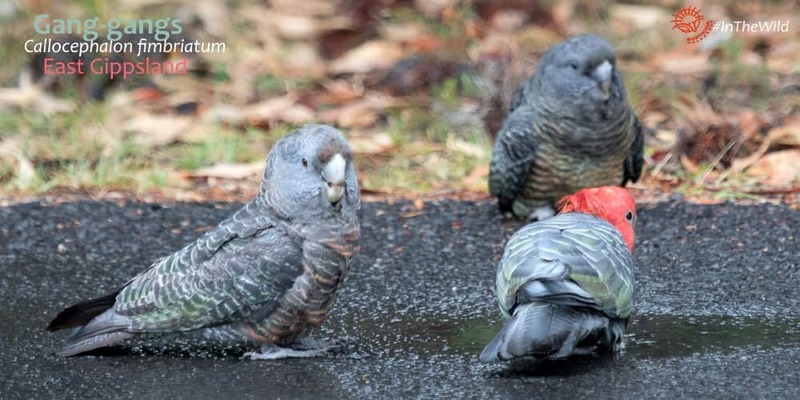 Through these tall eucalyptus trees fly Gang-gangs, dark grey forest cockatoos with glowing red heads. It’s an Australia made famous by paintings of the Heidelberg School – a group of 1800’s painters that first captured the shiny quality of light unique to this country. Through their paintings, they introduced ‘the bush’ to subsequent generations of Aussies, including me. 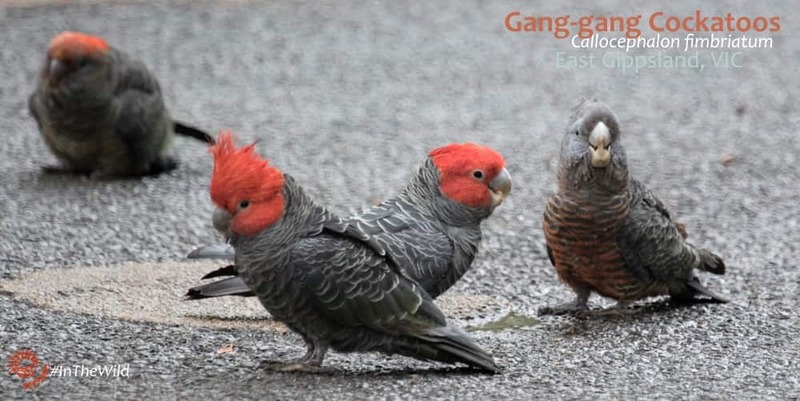 Gang-gang Cockatoos are the moving spirit of this Australia. 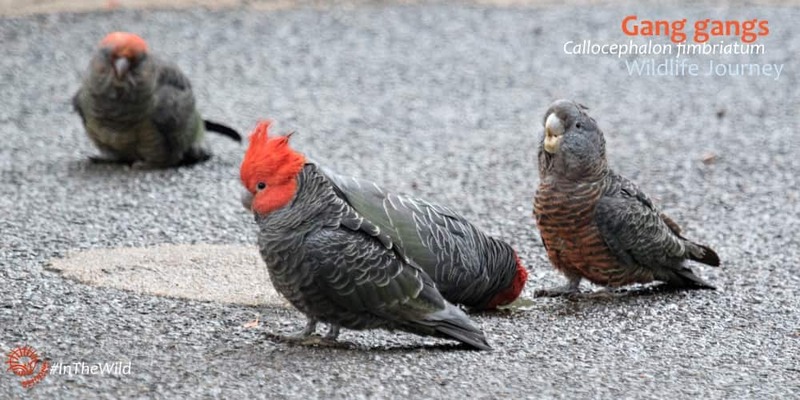 When first seen, flying high through the tall eucalyptus forest canopy, Gang-gang Cockatoos Callocephalon fimbriatum seem dark, mysterious. They are quiet for cockatoos and easily overlooked. Their call is a creaky sound, that could almost be made by the trees themselves creaking in the wind. 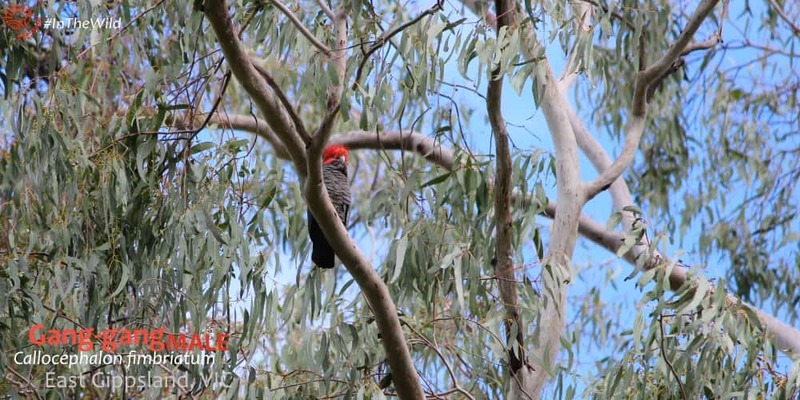 When they fly through the creamy trunks of Mountain Ash, Alpine Ash or Shining Gum trees, it’s a moment of wild beauty. Occasionally these wild mountain spirits descend to ground level, and we get a chance to see them properly. Wildlife Guide Martin and guests had such an opportunity on a recent Wildlife Journey 4 day tour. 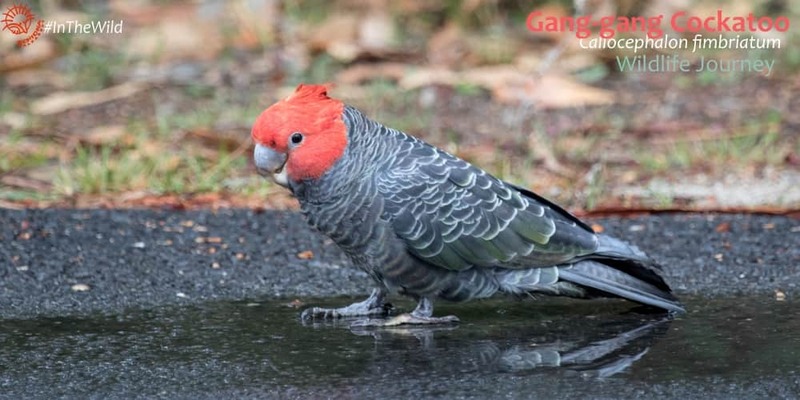 A family of Gang-gangs came to Cape Conran, a rocky headland in East Gippsland, after a shower of rain. They played around in some banksias, where Martin and guests first saw them. Then shyly, they all descended to the ground for a drink of delicious fresh rain water. At close range everyone could absorb their delicate beauty. The curled crest feathers of the adult males. The peach and tangerine barring on the female’s breast. The wing feathers touched with gold on both adults. The immature male’s emerging red head feathers. Its not just Gang-gangs that sometimes get close – check out how close this wild Echidna came to our guest! Early spring trips (September, October) and late autumn trips (April, May) are the best time to see them on our Wildlife Journey. Gang-gang Cockatoos like to feed in tall eucalyptus in the high mountains of East Gippsland in summer, and are more often seen near the coast in winter and early spring & late autumn. But we have seen them in all months. 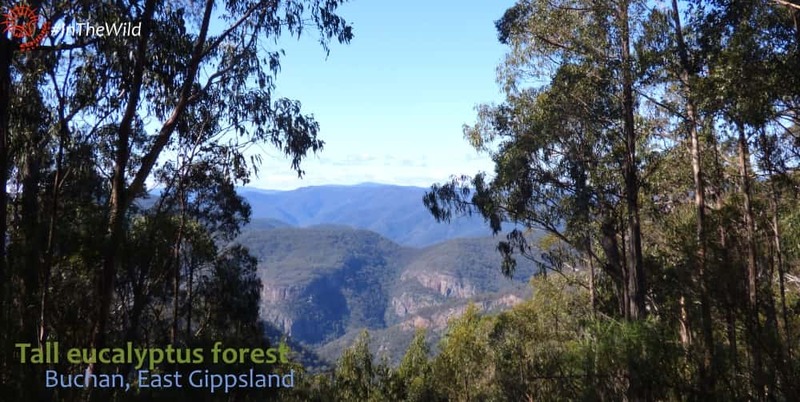 While your out there in the beautiful East Gippsland forests, you can also help the wildlife. Read about our conservation program on this tour. Do you love and want to photograph these beauties for yourself? Maximum Wildlife tour offers the greatest likelihood, with time for as much photography you want. 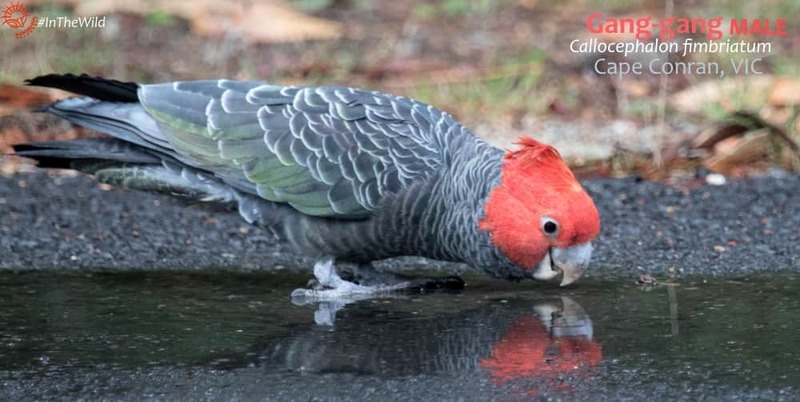 Gang-gang Cockatoos are listed as Secure in Victoria, but Vulnerable just across the border in New South Wales.